The client has 2 bottling lines, 1 much faster than the other. There was opportunity to shift more products to the faster line if only the efficiency on that line could be increased. The client had identified a number of improvement activities but wanted to confirm that these were indeed all of the opportunities. The client also wanted the activities proiritised so that products could be transferred onto the fastest line as soon as possible. 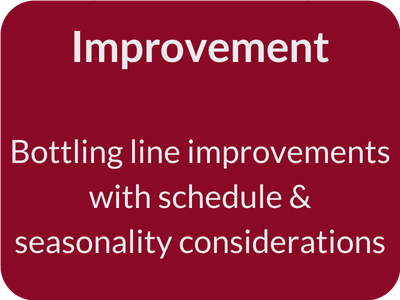 The client also wanted visibility of the performance impacts of schedule changes and product seasonality. A Value Stream Map at the Factory Level showing the distribution of capacities and buffers on the flow lines. Process Maps (Bullant Filters) to identify points of highest performance leverage. Schedules and sequences were reviewed to understand the extent of production levelling, seasonality and the best way to modify line allocations for maximum contribution margin per hour of production. 8 Performance-Centred Improvements (prioritised with costs and benefits) identified for each line for execution by the client’s improvement personnel. The Performance-Centred Improvements included high-value activities that the client had not identified previously. Client now had a comprehensive, prioritised and quantified roadmap for improvement, supported by data and with transparency regarding schedule performance and the effects of seasonality.